CERFA improves your conditions of the Erasmus+ Placement program for you to get the most out of your experience in Germany. All selected UAM students to develop a traineeship Erasmus+ Placement in a project within the call UAM/CERFA Traineeship 2018/2019 with a CERFA supervisor, will be supported with a package of financial assistance and training with the following objectives: (i) enable the access to all interested students in a research traineeship in Germany and; (ii) support their career development. – Financial support for transport and accommodation assistance to attend the classroom course: up to 250 euros. 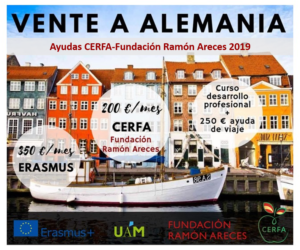 Increasing the monthly amount offered by Erasmus + Placement, CERFA, with the support of the Fundación Ramón Areces, aims to enable a greater number of students to request this type of Traineeship. Moreover, CERFA wants students to get the most out of their research stay in Germany, offering them a classroom course to support their career development. The main objective of this course is to give them tools to make an informed decision about their future professional steps. The topics of “what it means to do a PhD” and other professional options will be covered. The course also aims to be a meeting point for students who are making their stay in Germany, allowing them to expand their network. The package must be accepted entirely. Details and conditions of the Ayudas CERFA Fundación Ramón Areces can be read here (available only in Spanish).